If you are allowed to create Canvas courses, you can copy a course and create a new course shell. 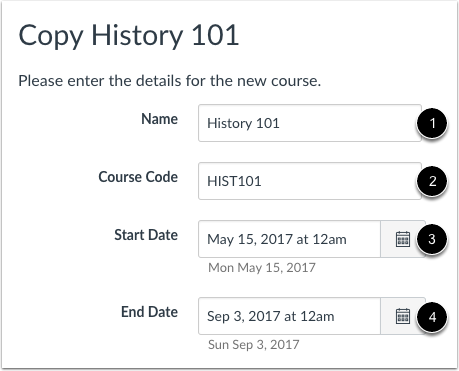 Copied courses are added to the same subaccount as the course that is copied. Courses should be copied when you want to use or repurpose previously created content including course settings, syllabus, assignments, modules, files, pages, discussions, quizzes, and question banks. You can also copy or adjust events and due dates. Not all content can be copied as part of a course. 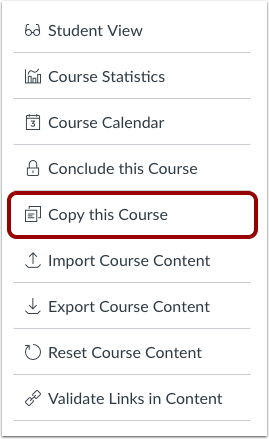 When you copy a Canvas course using the Copy this Course button, you will be added to the course as an instructor automatically. Course imports may not include all content. For more details, please see the import content section in the Canvas Basics Guide. Importing a course more than once may have unintended consequences. If you import content into a new course, edit the content in the new course, and later import the previous content again, the imported content will override the existing content. If the Copy this Course button does not appear in Course Settings, this feature has been restricted by your institution. However, if you already have access to a course shell, you can copy a course through the Course Import Tool. Click the Copy this Course link. Enter the Name  and Course Code  for the new course. The name will be displayed on the Course Home Page and in Conversations. The course code will be displayed at the top of the Course Navigation menu and in the course card in the dashboard. Course code is also referred to as the reference code or short name. Enter the Start date  and End date  for the new course. Note: If the current course includes course override dates in Course Settings, the Start and End date fields will be populated with those dates. 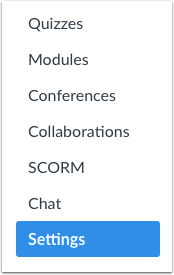 To import all content from the course, select the All Content radio button . If you want to select specific content, click the Select specific content radio button . Note: If you select the specific content option, you are required to select the content you want to import; this action cannot be cancelled. If you want to adjust the due dates associated with the course events and assignments, click the Adjust events and due dates checkbox. Click the Create Course button. The Current Jobs section displays the status of your import. Running reports display a menu bar with the time remaining to complete the import . If you chose to select specific content in your course, the current job will show as Waiting for Select , which means you must select the content you want to import. The import may also display other status indicators as part of the import process. Learn more about course import statuses. View the content from any completed imports by accessing any link in Course Navigation. Previous Topic:How do I archive a conversation as an instructor? Next Topic:How do I copy content from another Canvas course using the Course Import tool? Table of Contents > Course Import Tool > How do I copy a Canvas course into a new course shell? Re: Delete all students from class?? Re: How can i import past syllabi?